Silky, buttery avocados. 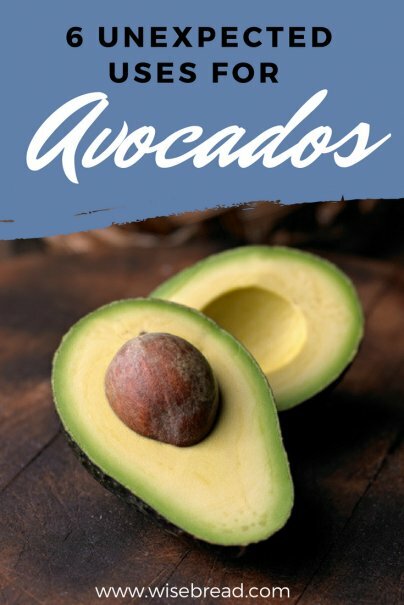 When you think of this nutrient-rich and tasty fruit, you probably think of guacamole. Surprise yourself by trying these unexpected uses for avocados. Want perfectly supple, smooth skin without having to buy expensive lotions full of weird stuff like parabens? Make your own, using avocados as the star ingredient. Here is a really easy avocado mask recipe that involves basic ingredients that are probably in your fridge right now. Simply leave the mask on for five to 10 minutes, then rinse when it starts to harden. Wash it away to reveal super soft skin. An excellent source of healthy fats and boasting such a smooth and buttery texture, avocados make a wonderful substitute for cream, coconut milk, or soy milk in frozen treats. Making these diet and vegan-friendly desserts is also insanely easy. Try making mint-chip avocado ice cream, or this recipe for avocado popsicles! Skin is one thing, but what about an all-natural deep conditioning treatment that will soothe a dry scalp and alleviate damaged hair? Avocado is rich in healthy oils that easily coat the hair shaft, but even more so when they are overripe. So, if you have some forgotten avocados that are no longer at peak deliciousness, this is a great use for them. Try this hair treatment recipe, which uses oatmeal and vinegar for a great at-home spa day. Avocado margaritas, anyone? Adding a creamy and somewhat savory taste to the classic drink makes for a refreshing update to a summer favorite. This frozen margarita recipe calls for avocado and tarragon. Just add tacos! Also delicious: try a savory Michelada with avocado slices or puree added in for an even dreamier meal-in-a-glass. Avocados for breakfast is no alien concept — we have breakfast burritos and omelets to thank for that. And, lately, avocado toast has become a hot snack for any meal. But have you heard of the baked avocado with an egg inside? It's two of the most delicious foods combined, plus it's stupidly easy to make, so why not try it tomorrow morning? Did you know that avocados make for a great and tasty transitional food during the period your baby is teething? It is firm enough to help them learn to chew, but soft enough to mash with their gums with ease. To share with younger or smaller babies, simply mash or puree the ripe and unseasoned avocados before feeding. Avocado also works as a great secondary ingredient in these homemade baby foods. How do you put avocados to good use outside a bowl of guac? Let us know in comments! I just had brunch with a friend who made avocado pancakes for me. They were so silky and smooth, it was unbelievable. A definite avocado taste, but who doesn't like avocados?